I have had my share of household cleaners, some work, some don't and some just have flat out false advertising. Let me tell you, Genesis 950 Concentrate Cleaner has got to be the best cleaner that I have used in my life. The product actually does what they say it does. The best thing about them is that they are Eco-Friendly! There is no alcohol, ammonia or bleach! 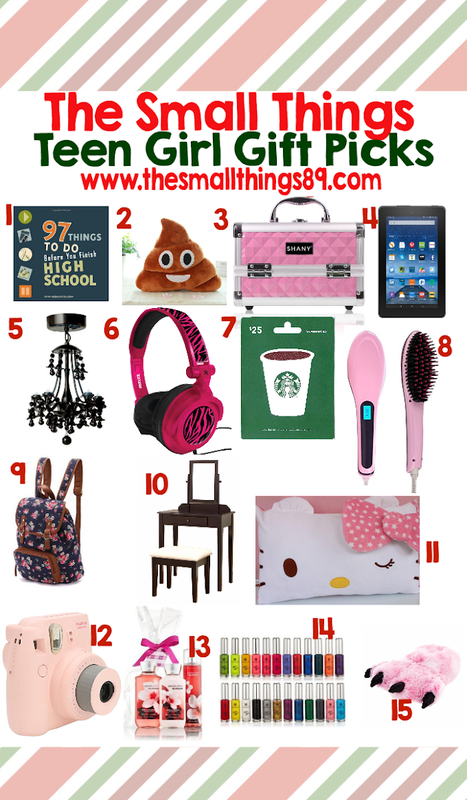 SO GREAT for those of you that have kids and pets too! This has go to be the best stain remover that I have ever used. 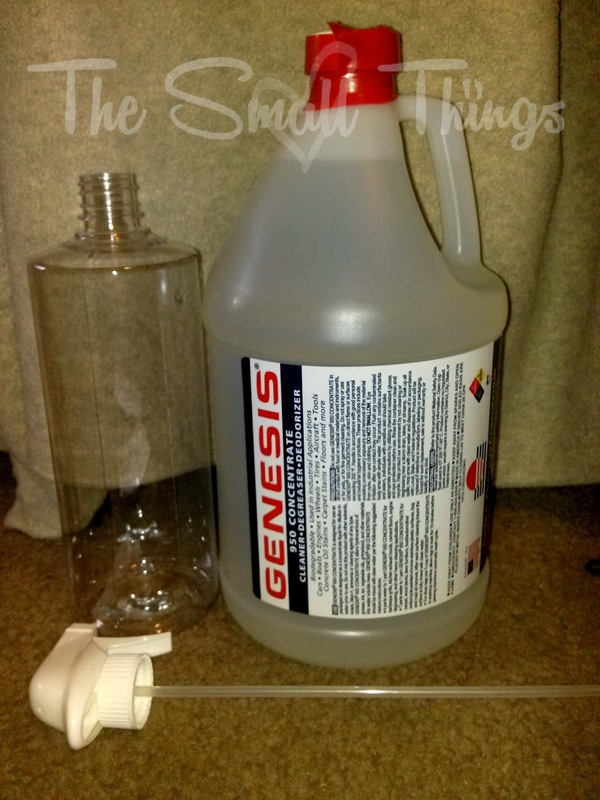 The gallon of Genesis 950 came with a spray bottle. Another thing about it, this is not just for carpets! You can clean floors, appliances, engines, counters, clothing, microfiber, leather, suede and more! You think of it, you can use it to clean it! It SAFELY removes grease, grime, soot, ink, tar, vegetable oil and insect residue. I used mine for spot cleaning. That is what I needed it the most for. Now that I have a puppy, it comes in handy when we have accidents too! For spot cleaning you mix 1 part of Genesis 950 to 7 parts of water in the spray bottle. For difficult stains, fill the bottle half way with cleaner and the other half with water. That is what I did. You simply find the stain you want to use it on, and spray with the mixture and let sit 2 minutes. After you let sit, SCRUB scrub scrub. Rinse with water and repeat if necessary. When finished you blot with a towel or use a wet vacuum to remove water residue. Check out below what it has done for me! The before and after photo's speak for themselves! I am going to have to go over this one one more time, It was a TOUGH stain. 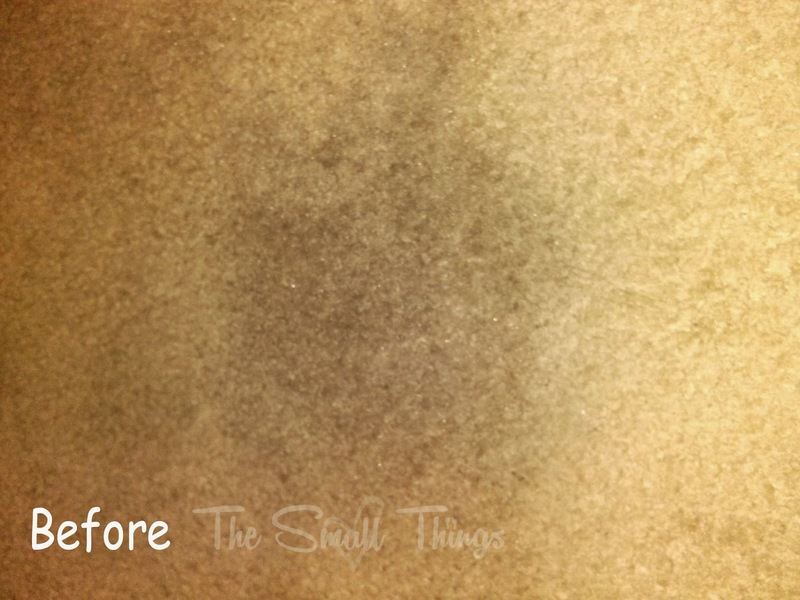 But the after result for a 3 year old stain says it all! Now, the couch. This couch was stained to heck. See what happened when I used Genesis 950 Concentrate. I no longer have to cover my couch up with a cover because I am embarassed. Nothing else would take these stains out! Genesis did!! Check out below what it did for the arm rest! This multi-purpose cleaner can be kept on hand to tackle anything you need to clean. Unlike other cleaners, Genesis 950 Concentrate works with water to get into the stain and break the bonds of the stain. Once this happens the stain is then lifted from the surface. Only when this action happens will you remove the pet stains AND odors. Remember how I said it can be used on multiple surfaces? 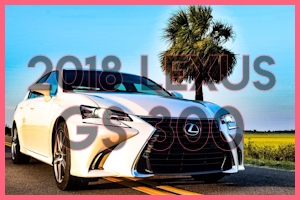 Have a grease stain in the driveway? Take it out and try it! I can guarantee it will work! I am so happy that I was able to try this for myself. I will never purchase another household cleaner again. Genesis 950 has me for life! Want to use it for more than just a spot cleaner? Check out the website HERE for instructions and see other ways to use it! 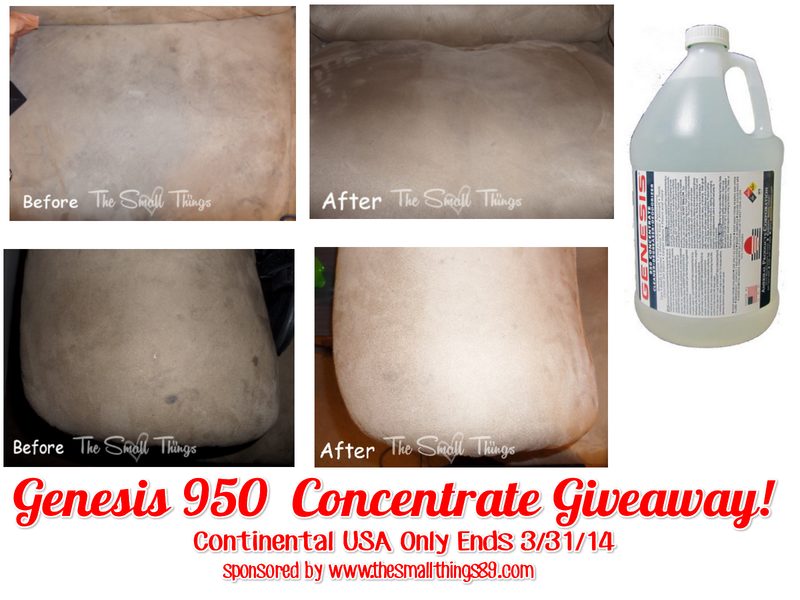 You can purchase a gallon of Genesis 950 with a spray bottle for only $42.00 on their website! And you can buy on amazon as well! This is great because you can't find it elsewhere! 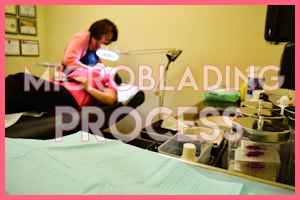 No third party to go through, you go directly through them so that you can get the best care and customer service possible. Be sure to visit them on their social media to stay up to date with the latest! Thanks for reading! Our pets always make the worst messes to clean up. 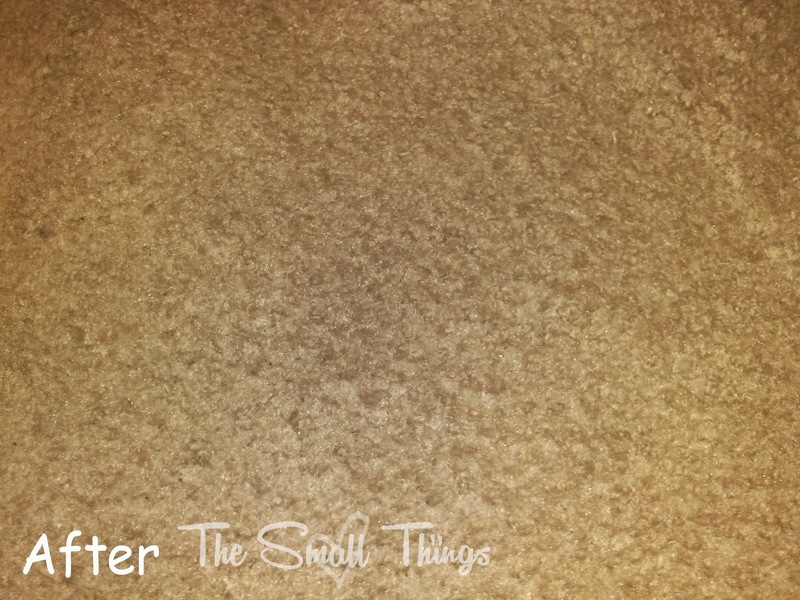 The toughest things to tackle are carpet stains thanks to my toddler! My toughest thing is my carpet. I clean it and it looks Great ,but then after about a month the stain comes tight back up again. The carpet has my toughest stains. UGh! My little one with her crayons, candy, and dirty shoes on our carpet, couch, and rugs!! lol Gotta love them though! the toughest thing for me is always car oil and grease! One of the toughest things for me to keep clean is the carpet! Having my two year old recently potty trained and being a two year old, I need a cleaner just like this. It looks remarkable! Definitely the White Carpet and the White Rubber Handles on our refrigerator are the toughest to keep clean, esp. with 4 dogs and 2 kids. With two standard poodles, it would be keeping the carpets and furniture clean. Material Furniture is hardest to clean. My toughest stain is black mud tracked in by 2 boys and 2 dogs. Oh Em Gee - carpets! Even when I send rugs out to be professionally cleaned, there are spots left. Arrgh! In my home the carpet is the toughest stain. 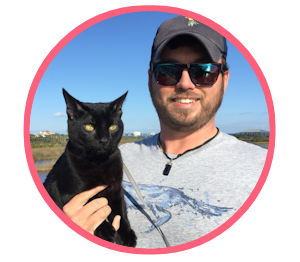 I have six pets; three cats and three dogs, a rabbit, guinea pigs, and a husband! I need cleaners! Our cat is 21 years old, and her tummy is getting a bit sensitive. Her throw ups are my biggest cleaning challenge! The toughest stain is lipstick that my 3 and 4 year olds get into! I always have issues with couch, carpet and bed stains!! My worst pets are usually the worst stain and mess makers but my kids are a close second!! The carpets are the hardest to keep clean. I tell the kids to take their shoes off but most of the time they forget,!! Right now, I'm having a horrible time getting the statins out of my mattress. While potty training my two year old, we had some accidents and I can't get them to go away!! I truly think this product could do just that! I hate cleaning the cat litter! Everything always gets stuck to the actual litter box and it smells. I have the biggest problem cleaning the bathtub/shower area. I simply do not understand how it gets so yucky! Everyday, multiple times it is soaked with warm soapy water, lol. I find that Scrubbing Bubbles and wire mess work best. It's such a chore cleaning the toilets and sinks! I absolutely loathe tile and grout, combined with soap scum, it's even more catastrophic. Toughest thing to clean in my house is the ring around the toilet. One of my biggest problems is trying to get my hair out of the my carpets. I don't understand how it happens but there is more hair in my carpet than on my head! I hate cleaning my bathroom! Another thing I have problems with is cleaning the blinds. Anyone know a good way to do that?! I have trouble cleaning grout. Toughest thing is the stains my little ones make! The toughest thing I have to clean is our carpets. We have a 6year old and he is prone to spilling things, leaving playdoh in the floor and then we have a Boxer on top of it to add to the mess, stains and odor. Today I discovered that it is very difficult to remove layers of grease and splatter from a toaster oven! The hard thing to clean is the room carpets.